Meet like minded people in this creative environment in Skopje. Spread over two floors, this well-designed, attractive space is wonderfully located just five minutes away from the city centre by foot- ensuring you stay well connected to inner city amenities. One floor consists of 12 desks ideal for freelancers and entrepreneurs, a small kitchen area and a conference room, while the other floor is used as a relaxation area. The centre features highly flexible leased office spaces offering the opportunity for occupants to arrange interior working environment to suit their specific and particular requirements within an excellent value, premium professional location. 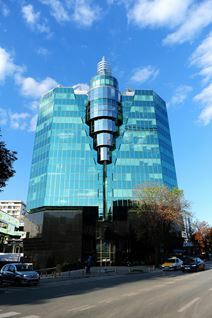 The centre not only offers a huge range of exceptional services and amenities on-site within the adjoined retail area, but is also in the immediate vicinity of further local services and attractions including the Macedonian Parliament, Assembly of the Republic of Macedonia, Telekom Arena and Skopje City Park and is within walking distance from the Vardar River.